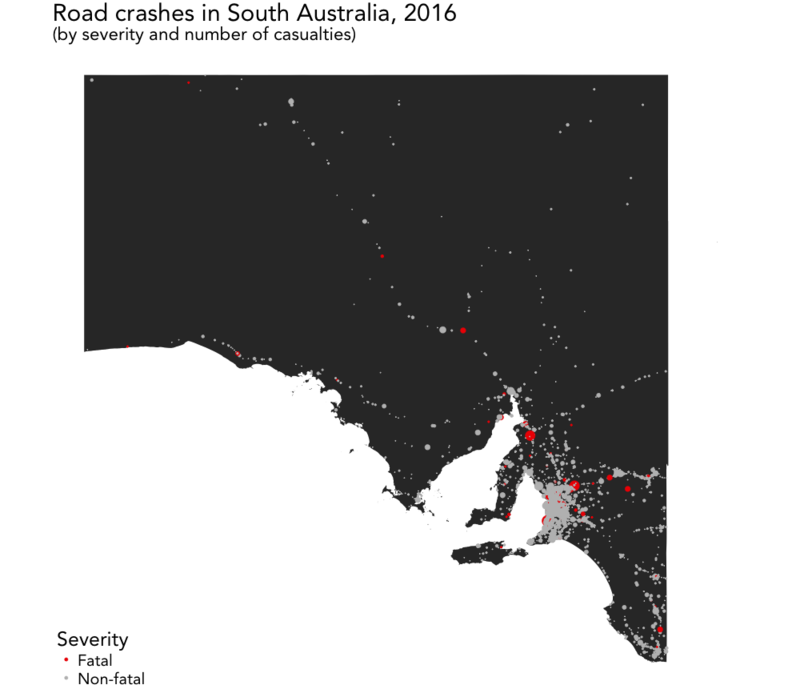 Since I may already have acquired a bit of a reputation for being preoccupied with accident analyses, I decided to give it another shot and map and analyze all (non-)fatal road accidents happening in South Australia in 2016. Data for this analysis is provided by the South Australian Government Data Directory. Running the code below requires the packages ggmap, ggplot2, ggthemes, magrittr, maps, mapdata, maptools, proj4, raster, rgdal, sp, stringr, and tidyverse. For loading multiple packages at once, I conventionally use p_load() from the pacman package which is a wrapper function for library() and require() and installs missing packages if necessary. After getting the data into R, some minor data cleaning is required. 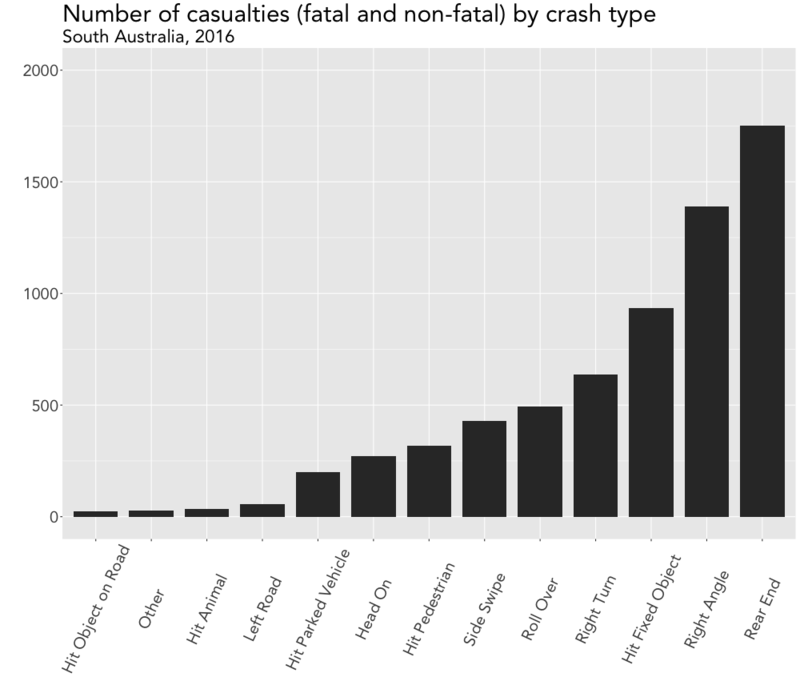 accidents$fatality[accidents$csef_severity == "4: Fatal"] <- "Fatal"
accidents$fatality[accidents$csef_severity != "4: Fatal"] <- "Non-fatal"
accidents$crash_type[accidents$crash_type == "Left Road - Out of Control"] <- "Left Road"
Prior to finally analyzing the accident data, some more geographical data wrangling needs to be done. As a first step we need to choose the right projection for transforming the x and y coordinates provided in the data set into their respective longitude and latitude equivalents. proj <- "+proj=lcc +lat_1=-28 +lat_2=-36 +lat_0=-32 +lon_0=135 +x_0=1000000 +y_0=2000000 +ellps=GRS80 +towgs84=0,0,0,0,0,0,0 +units=m +no_defs"
After setting the right projection/coordinate reference system, we can then transform the accident coordinates to spatial points using project() from the proj4 package. names(accidents)[names(accidents) == "latitude"] <- "lat"
In order to map the spatial points we need matching Australian shapefiles (.shp; a geospatial vector data format for GIS software), which luckily can be found at the South Australian Government Data Directory’s website as well and consist of both country outlines and state borders. 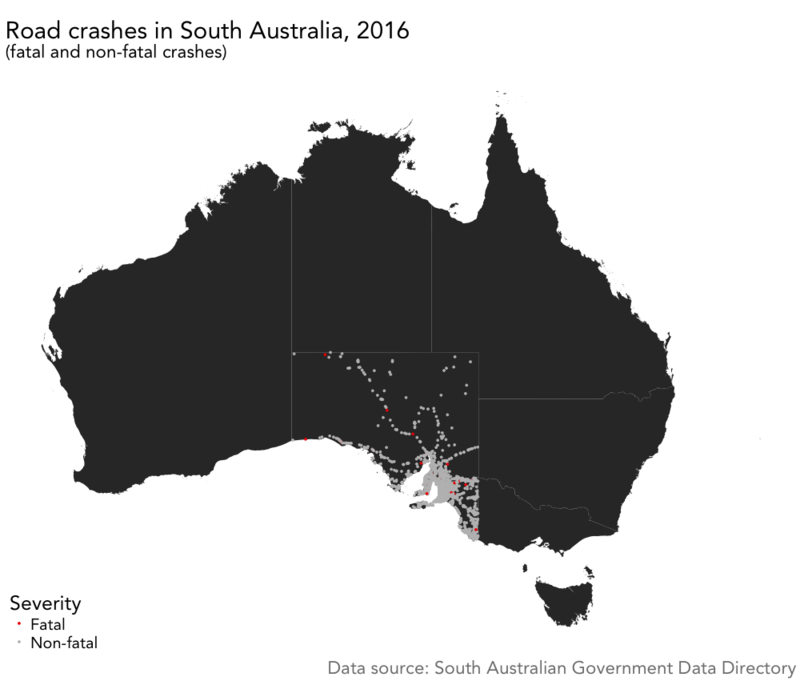 For creating a tailor-made map depicting road accidents in South Australia only, we need to subset the state polygon from the spatial SpatialPolygonsDataFrame object aus_shp (STE denotes state). 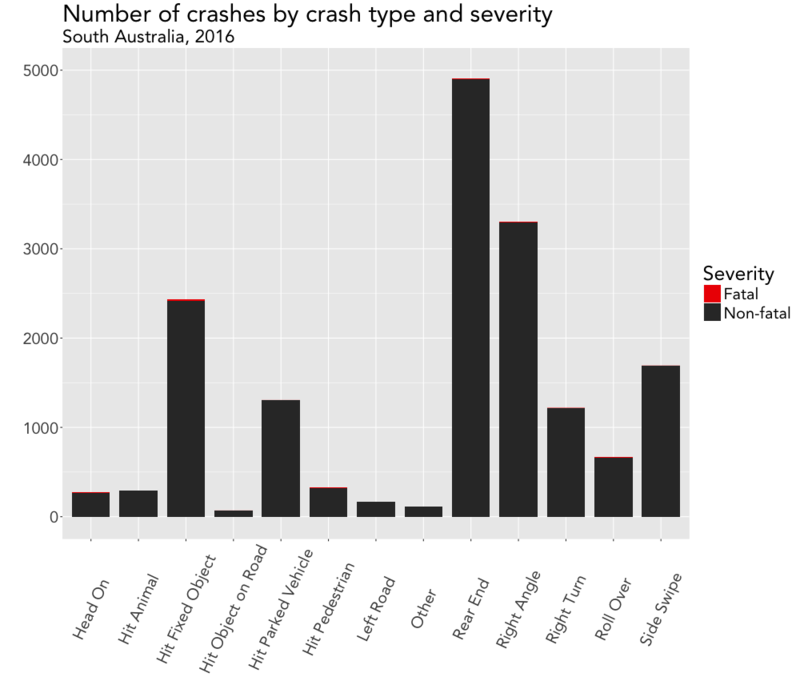 After having mapped all road crashes, we can further analyze the data by visualizing some basic statistics. 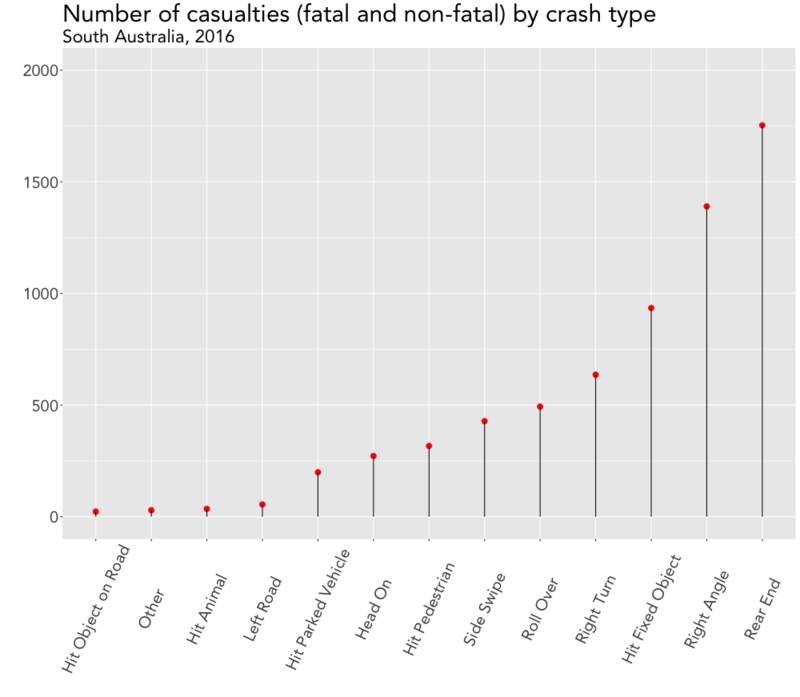 In a similar manner, we can make another bar chart for the number of casualties by crash type. Prior to plotting, however, we need to calculate the corresponding numbers first. As a bonus feature we now rearrange the bars of the plot by ordering the crash types by number of casualties in ascending order. While browsing this site, I found both inspiration and sample codes for making some #dataviz magic happen. As a result, I decided to finish up this post by complementing the previous chart with its more modern looking lollipop counterpart. Note: The above code is only a (slightly adapted) snippet of the full script, which can be found here.